The title of comedian Laurence Clark’s latest show has caused an element of huffing, puffing and raising of eyebrows. 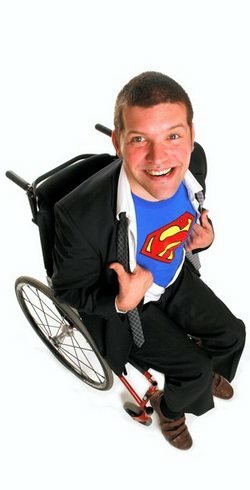 Spastic Fantastic is the latest show from the wheelchair-using funnyman, confronting issues about disability. Previous shows have taken issue with Jim Davidson after he refused to do a show on discovering that there were people in wheelchairs in the front row, then he took a wry look at how villains in films are often ‘afflicted’ with a physical impairment, as if it reinforces their evil nature, and now he’s taking on the word that has been bandied around as a term of insult in the playground and beyond. “The show follows my attempts to reclaim the word ‘spastic’. It’s my journey, then you see at the end whether or not I’ve decided if it’s worked. Clark has cerebral palsy, meaning he uses a wheelchair, requires a care assistant to help him do many things we take for granted, and has some speech and movement impairment. What he hasn’t let it do is hold him back in life. 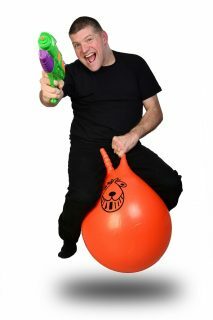 He has a PhD in Bioinformatics, is a proud father to his little boy, gives talks on disability awareness, and has produced some top class comedy shows over the years, garnering critical acclaim for his tack-sharp wit. All the more reason to reclaim that word ‘spastic,’ a term used over the years to dismiss and demean people with disabilities. “All through my childhood it’s how I was labelled. In the ‘80s Blue Peter put on its appeal for ‘spastics’. It was in common usage and certainly applied quite liberally to people like myself. “If you look back, it was only really in the Nineties that it became unacceptable. The show was a success in Edinburgh last year, and has been touring the UK sporadically since. In fact it’s a pattern that’s emerged for Clark over the past few years, having spent each successive set of 12-month periods in “the same old routine of writing shows, taking them to Edinburgh getting good reviews there, trying to tour them a bit, thinking that you’re getting somewhere and then starting from scratch again. It’s quite depressing when you look at it like that,” he laughs. Not that he’s complaining, stand up is something that he adores. “The buzz you can get from making people really laugh at something you’ve done, that’s really good. “One of my day jobs is training the local authorities and other organisations on disability issues and you can do far more with 20 minutes of stand up than you can do in a day’s training. “Because if you can get people to laugh with you and adopt your perspective – which ultimately that’s what stand up is, convincing a roomful of people to look at the world the way you look at it – it’s absolutely powerful. After this tour he’s already got an eye on the next project, inspired by President Obama’s proposed healthcare reforms and the opposition to it. “I’m going to go around America for a week with a camera crew and try and persuade them that they should have an NHS like ours. “I was over there last year and they have all these weird ideas about our healthcare, very bizarre urban myths, things I’ve never really heard here. “My personal favourite is in one of the papers last summer, someone wrote that if Stephen Hawking had been born in Britain, he’d be dead by now. The arrogance to presume that Stephen Hawking must be American!